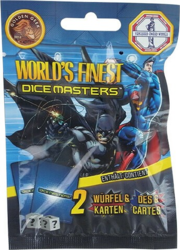 Dice Masters: World's Finest is a dice-building game designed by Quarriors! creators Michael Elliott and Eric M. Lang. In this game, each player brings together a team of superheroes, where each hero - Batman, Wonder Woman, Superman, Zatanna, Martian Manhunter, etc. - is represented by a special die. Each team must be composed of 15 dice. Each hero also has one or more character cards, which detail the special abilities associated with each symbol of their die. Different versions of these cards will be available in the boosters, allowing for greater customization of your team. The dice are used to collect energy, recruit new heroes, and of course to attack the opposing team. In addition, each player brings to the game two action cards that are placed in the center of the table, these cards can be purchased.